ToyotaCare no cost maintenance covers 2 years or 25k miles whichever comes first. See Toyota dealer for details and exclusions. Valid only in the continental U.S. and Alaska. On select 2018 models with approved credit. No down payment, excludes tax, tag, license and registration fees. Includes $399 documentation fee. 0.0/0.0/0.0/0.0 annual percentage rate financing with respective terms of 36/48/60/72 months. Offers apply to well-qualified buyers and requires approved credit and financing through Southeast Toyota Finance. Not all buyers will qualify. Payments for the first 90 days are deferred. Monthly payment for every $1,000 financed is 0.0% – 36 months = $27.78; 0.0% – 48 months = $20.83; 0.0% – 60 months = $16.67; 0.0% – 72 months = $13.89. No down payment required. May not be combined with other offers. Expires 12/31/19. Availability subject to change on TRD Pro models. 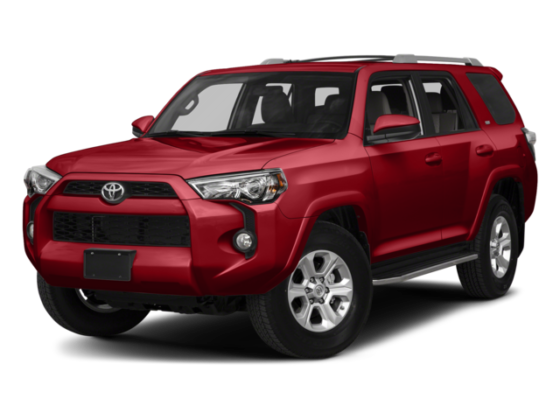 Apart from a unique front-end design, 4Runner Limited comes with refined accents like chrome door handles and a chrome-accented front grille that give it a personality of its own. Say hello to 4Runner TRD Off-Road and TRD Off-Road Premium—two tough SUVs to help you rule your favorite trails. This SUV stands apart with unique features like 17-in. 7-spoke alloy wheels with black-painted accents and stylish TRD Off-Road badging. The inside is just as awesome with its TRD shift knob, TRD Off-Road floor mats1 and available TRD headrest lettering. Contemporary ruggedness. 4Runner SR5’s front end lets everyone know you mean business, while still paying tribute to the iconic image that has distinguished 4Runner for years. Brilliant during the day, and night. These taillights send a clear signal to everyone around you and help increase visibility. This distinctive look will be sure to attract all the right attention. Every 4Runner grade has a unique wheel style to enhance its personality. The SR5 comes with 17-in. 6-spoke alloy wheels. Trail features rugged 17-in. 7-spoke alloy wheels. Limited has refreshed, stylish 20-in. split 6-spoke wheels. Function and style come together in 4Runner’s projector-beam headlights. These headlights provide a stronger and higher-focused beam than conventional headlights, and the smoked trim adds a stroke of boldness to their style. These also incorporate Daytime Running Lights (DRL) to help make you more visible to approaching vehicles. 1 This floor mat was designed specifically for use in your model and model year vehicle and SHOULD NOT be used in any other vehicle. To avoid potential interference with pedal operation, each mat must be secured with its fasteners. Do not install a floor mat on top of an existing floor mat. 4Runner’s instrument panel shape is tailored to accommodate high-end technology, such as the 6.1-in. high-resolution touch-screen display, standard on all models. Also standard is Optitron instrumentation, which makes the gauges easy to see, day or night. It may look tough outside, but inside it feels exceptionally refined. That’s because we have used premium materials like SofTex® on the SR5 Premium and Trail Premium grades, and perforated leather on Limited. It’s the perfect blend of ruggedness and comfort. All 4Runners feature an 8-way power-adjustable driver’s seat with power lumbar support. Step up to SR5 Premium or Trail Premium and get a 4-way power-adjustable front passenger seat in addition to heated front seats. Limited adds heated and ventilated front seats, plus driver’s seat memory to automatically go back to your ideal position every time you strap in for a ride. Take it all in. Available on 4Runner SR5 Premium and TRD Off-Road Premium, and standard on Limited, the power tilt/slide moonroof brings you closer to the great outdoors, without even stepping out of the car. 1Active front headrests can help reduce the extent of whiplash in certain types of rear-end collisions. Entune® App Suite1 brings mobile apps and data right into the heart of your 4Runner. Need to find gear for your upcoming adventure? Use Destination Search. Need to make a dinner reservation? Use OpenTable®. Want to spice up your playlist? Use Pandora® 2 And that’s just the start: With Facebook Places, Yelp®, iHeartRadio, Slacker Radio and more apps, your smartphone won’t be the only smart tech in the car anymore. Integrated Navigation3 gives you turn-by-turn directions, HD predictive traffic and Doppler weather overlay—all straight from the 6.1-in. high-resolution touch-screen display. Bluetooth® 4 wireless technology gives you hands-free phone capability, phone book access, advanced voice recognition5 and music streaming,6 so you have access to your phone without even glancing at it. Lending the soundtrack to your many adventures is 4Runner Limited’s JBL® audio system. To ensure you don’t miss a note of your music’s soaring highs or thundering lows, the system boasts an amazing 15 speakers, including a subwoofer. The standard integrated backup camera7 display not only helps with backing into a tight spot, but is also the perfect companion for hitching your trailer. Now you can keep an eye on the important things, like your boat. 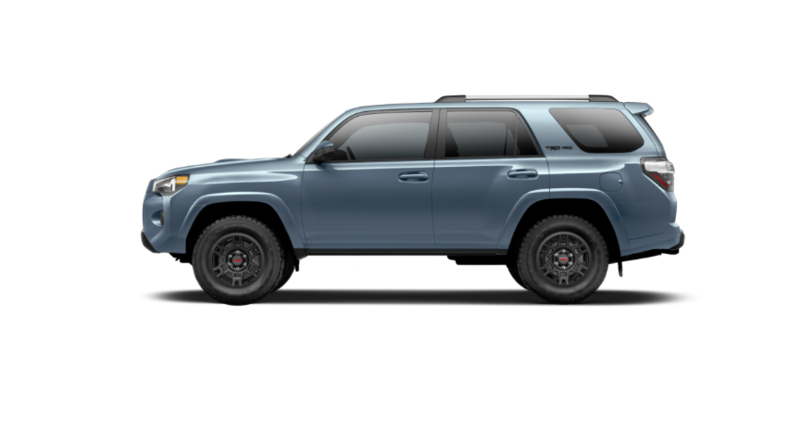 4Runner Limited’s standard sonar8 sensors located in the front and rear bumpers help make parallel parking easier by detecting obstacles and warning the driver with a series of tones. 1Be sure to obey traffic regulations and maintain awareness of road and traffic conditions at all times. Apps/services vary by phone/carrier; functionality depends on many factors. Select apps use large amounts of data; you are responsible for charges. Apps and services subject to change. See toyota.com/entune for details. 2PANDORA®, the PANDORA® logo, and the Pandora trade dress are trademarks or registered trademarks of Pandora Media, Inc., used with permission. 3Availability and accuracy of the information provided by the navigation system is dependent upon many factors. Use common sense when relying on information provided. Services and programming subject to change. Services not available in every city or roadway. Updates may be available from your dealer at an additional cost. 4The Bluetooth® word mark and logos are registered trademarks owned by Bluetooth SIG, Inc., and any use of such marks by Toyota is under license. A compatible Bluetooth®-enabled phone must first be paired. Phone performance depends on software, coverage and carrier. 5Advanced voice recognition capabilities vary by head unit. 6Apps/services vary by phone/carrier; functionality depends on many factors. Select apps use large amounts of data; you are responsible for charges. Apps and services subject to change. See toyota.com/entune for details. 7 The backup camera does not provide a comprehensive view of the rear area of the vehicle. You should also look around outside your vehicle and use your mirrors to confirm rearward clearance. Environmental conditions may limit effectiveness and view may become obscured. See Owner’s Manual for additional limitations and details. 8 Do not exclusively rely on the parking assist sonar system. Always look over your shoulder and use your mirrors to confirm clearance. Certain vehicle and environmental conditions may affect the ability of the sensors to detect an object. Even the shape and composition of the object can be a factor. See Owner’s Manual for additional limitations and details. Every adventure has its own demands. With 4Runner’s 40/20/40 fold-flat second-row seats you can make room for everything you need by folding one or both seats down to accommodate up to 88 cubic feet of cargo.1 When not folded down, the seatbacks recline for added passenger comfort. If you’re all about the entourage, you’ll be able to accommodate up to seven passengers with the available third-row seating on the SR5 and Limited grades. The seats also have a 50/50 split capability to make room for cargo. 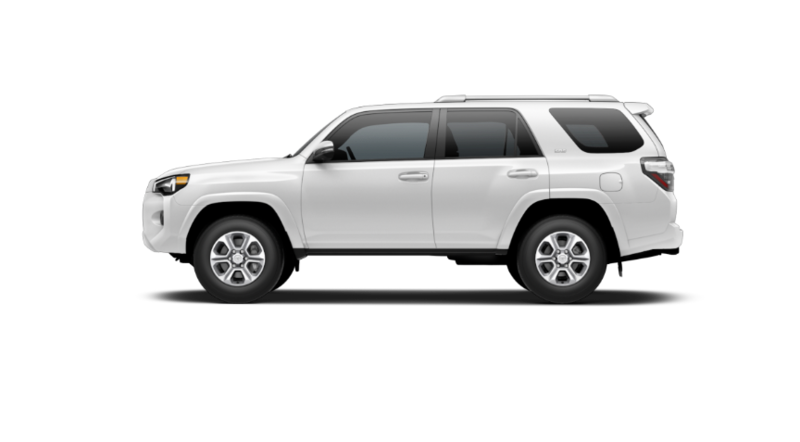 4Runner is the only SUV in its class that has this.2 The power rear glass lowers with a push of a button, making it easier to grab your gear from the cargo area. Get quick access to your gear, or the cooler. The available sliding rear cargo deck can support up to 440 lbs.1 and helps make for an easy reach to your gear, or a quick setup before heading to the great outdoors. 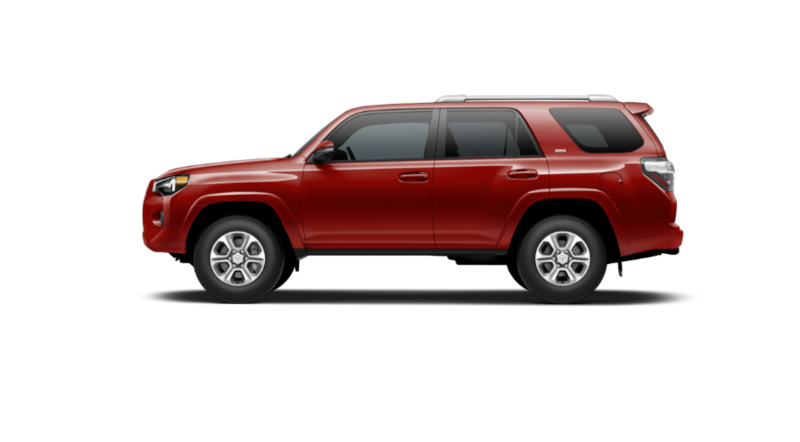 When you approach your 4Runner Limited with the Smart Key in your pocket, the interior and puddle lights illuminate automatically, the doors and rear liftgate open with the touch of a handle, and the engine starts with a push of a button.3 Getting the trip started is that easy. A 120V AC power outlet is conveniently located in the cargo area so you can keep the things you need the most charged, like your phone or the air compressor. 1Cargo and load capacity limited by weight and distribution. 2based on manufacturers’ data, May 2017, midsize SUV segmentation. 3The Smart Key System may interfere with some pacemakers or cardiac defibrillators. If you have one of these medical devices, please talk to your doctor to see if you should deactivate this system. To help provide extra occupant protection if the vehicle is struck from the side, impact beams are located inside all doors, and are designed to absorb energy and help reduce the chance of intrusion into the cabin. Proper tire pressure is important not only for good handling and fuel economy, but also for your safety. 4Runner’s standard Tire Pressure Monitor System (TPMS) evaluates the pressure of the tires and issues a warning if the pressure becomes critically low. With available Safety Connect®,9 emergency assistance is always within your reach. Via Toyota’s 24/7 call center, Safety Connect® offers subscribers helpful features such as Emergency Roadside Assistance, Stolen Vehicle Locator, Roadside Assistance and Automatic Collision Notification. 1All the airbag systems are Supplemental Restraint Systems. All airbags (if installed) are designed to inflate only under certain conditions and in certain types of severe collisions. To decrease the risk of injury from an inflating airbag, always wear seatbelts and sit upright in the middle of the seat as far back as possible. Do not put objects in front of an airbag or around the seatback. Do not use a rearward-facing child seat in any front passenger seat. See Owner’s Manual for further information/warnings.2The Toyota Tire Pressure Monitor alerts the driver when tire pressure is critically low. For optimal tire wear and performance, tire pressure should be checked regularly with a gauge; do not rely solely on the monitor system. See Owner’s Manual for further information/warnings. 4Covers normal factory scheduled service for 2 years or 25K miles, whichever comes first. See Toyota dealer for details and exclusions. Valid only in the continental U.S. and Alaska. 5Does not include parts and fluids, except emergency fuel delivery. Valid only in the continental U.S. and Alaska. 6Vehicle Stability Control is an electronic system designed to help the driver maintain vehicle control under adverse conditions. It is not a substitute for safe and attentive driving practices. Factors including speed, road conditions, weather and driver steering input can all affect whether VSC will be effective in preventing a loss of control. See Owner’s Manual for further information/warnings. 7Brake Assist is designed to help the driver take full advantage of the benefits of ABS. It is not a substitute for safe driving practices. Braking effectiveness also depends on proper vehicle maintenance, and tire and road conditions. See Owner’s Manual for details. 8Smart Stop Technology® operates only in the event of certain contemporaneous brake and accelerator pedal applications. When engaged, the system will reduce power to help the brakes bring the vehicle to a stop. Factors including speed, road conditions and driver input can all impact stopping distance. Smart Stop Technology® is not a substitute for safe and attentive driving and does not guarantee instant stopping. See Owner’s Manual for details. 9Contact with the Safety Connect® response center is dependent upon the telematics device being in operative condition, cellular connection availability, navigation map data and GPS satellite signal reception, which can limit the ability to reach the response center or receive emergency service support. Enrollment and Telematics Subscription Service Agreement required. A variety of subscription terms is available; charges vary by subscription term selected. *MSRP excludes the Delivery, Processing, and Handling Fee of $895 for Cars (Yaris, Yaris iA, 86, Corolla, Corolla iM, Camry, Camry HV, Prius LB, Prius c, Prius v, , Prius Prime, Mirai, Avalon, Avalon HV), $995 for Small/Medium Trucks, SUVs and Van (C-HR, RAV4, RAV4 HV, Highlander, Highlander HV, 4Runner, Sienna, Tacoma), $1,295 for Large SUVs (Sequoia, Land Cruiser), and $1,295 for Large Truck (Tundra). (Historically, vehicle manufacturers and distributors have charged a separate fee for processing, handling and delivering vehicles to dealerships. Toyota’s charge for these services is called the “Delivery, Processing and Handling Fee” and is based on the value of the processing, handling and delivery services Toyota provides as well as Toyota’s overall pricing structure. Toyota may make a profit on the Delivery, Processing and Handling Fee.) Excludes taxes, license, title and available or regionally required equipment. The Delivery, Processing and Handling Fee in AL, AR, FL, GA, LA, MS, NC, OK, SC and TX will be higher. Actual dealer price will vary. Toyota of Rock Hill	34.9423695, -80.9709215.